For today’s 21 Daring Days writing task — the fourth — I’m to share with you ‘a story about a smell that means something to you (from your past or present’. Just forming the word in my head unleashes a cascade of memories, a tapestry of emotions, all of them driven by one very distinctive smell. Actually, I think I’m a little in love with calamine lotion and its heady mix of zinc and ferric oxides. I have been known to pour some of this strange vivid pink liquid onto a ball of cotton wool and just stand there sniffing it in some sort of a daze before putting it to good use. And it’s been put to good use a lot, down the years. 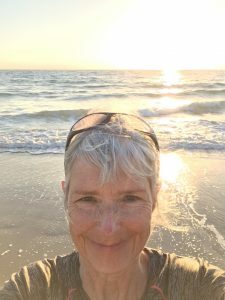 With Irish forebears on both sides of my family, the odds were fairly high that I’d emerge with one shade of pale Celtic skin or another. The sort that burns at the first hint of a watery sun and produces so many freckles that, if you live long enough (and I have), they eventually pretty much join up. So it made perfect sense for my parents to head for the Med every summer, somewhere nice and hot with cloudless skies and plenty of glorious sea to bounce back the rays onto their dazzlingly white daughter. To be fair, my mother — who had wisely focused on her French father’s genes and just had to wave briefly at the sun to tan — did her best to protect me. We travelled with an assortment of creams and t-shirts and hats, but I still always seemed to end up with some part of me turning a compelling shade of lobster. At which point, out came the calamine lotion and cotton wool, carefully trundled across Europe in anticipation of this very moment. The bottles were all glass back then — in fact, it’s good to see that they mostly still are — and some of the ones nestling in my amongst my earliest memories even had cork stoppers which had to be carefully eased and wiggled out with a gentle squeaky pop. My mother would start with the ritual bottle shaking — calamine creates a very distinctive glug when agitated. Next would come the pouring to saturate a lump of cotton wool. All the while I lay still on my holiday bed, nervously anticipating the coldness of contact. Then, as Mum painstakingly dabbed away at me until whichever bit I’d managed to fry was covered, my head would be slowly annexed by the lotion’s astringent yet comforting smell. Quite often we’d be in that special kind of daytime semi-dark you get in a shuttered room, and after the dabbing I’d lie there watching in the half light with fascination as the bright pink liquid quickly dried, turning almost white on my skin. This sequence of events was repeated in hotels, villas and apartments right along the Mediterranean and Adriatic, in France, in Spain, in Italy, and in what is now Montenegro but was then Yugoslavia. Year by year, room by room, my mother and I left a calamine trail as my skin resolutely refused to play the tanning game. The bottle mostly stayed in the medicine cabinet between summer sorties, but one year, when I was 13, it was dusted down early: I had chicken pox. 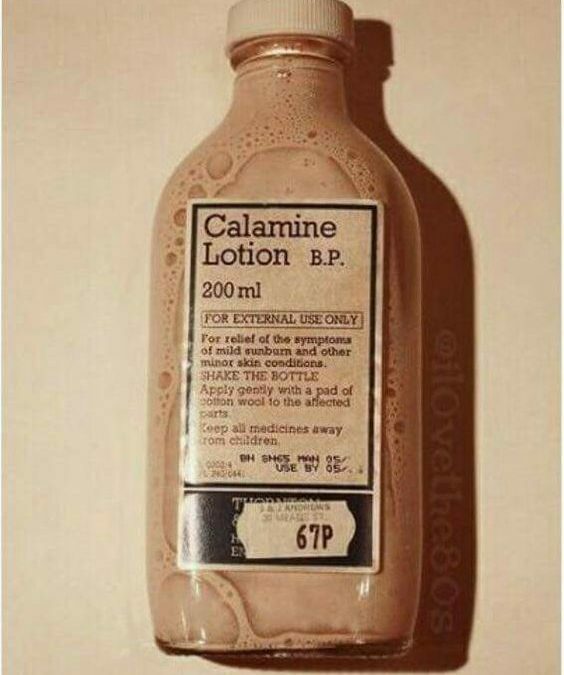 Calamine lotion followed me faithfully into adulthood: out it came when my daughter had chicken pox as a toddler, and although she grew up protected by sunscreen (just as well: I’ve handed down my skin genes), she would nonetheless end up with the odd red patch, random rash, or insect bite. And so that heady smell would fill her room, just as it had mine. Even now, I still occasionally miscalculate my skin’s relationship with the sun, or I’ll acquire a few stray bites, or brush by a nettle patch while running, and out comes the calamine, my first port of call. Any excuse, really, Any excuse. Very nice, well described to make me smile. Smell is one of the great time tunnels of life.